Redemptorist Father Martin Crowe, a well-read and multi-talented priest, died June 27, the feast of Our Lady of Perpetual Help, at St. John Neumann Residence in Saratoga Springs, NY. He was 92 years old. Father Crowe, one of six children born to Richard and Lucrece Garrity Crowe, was a native of Erie, PA, and grew up in Holy Rosary Parish. On finishing grammar school, he entered the Redemptorist seminary in North East, PA, and completed his education for the priesthood at Mount St. Alphonsus in Esopus, NY. He made his first profession of vows in 1935 and his final profession in 1938. He was ordained to the priesthood on June 23, 1940. Recognizing his gift for scholarship, his Superiors sent Father Crowe to The Catholic University of America in Washington, DC, where he earned a S.T.D. in Moral Theology in 1944. Then, responding to an urgent national need, Father Crowe volunteered to serve as an Army chaplain from 1944 to 1947. When Father Crowe returned from the Army, he was appointed director of the St. Gerard Guild, a post he held until 1964. Throughout those years, he promoted devotion to the Redemptorist saint, who is know especially as a patron of expectant mothers and their children, as well as couples who are hoping to be blessed with a child. He was in residence at Mission Church in Boston for eight months, then at St. Philomena Church in Pittsburgh (1947-48), Our Lady of Perpetual Help in New York City (1948-65) and again at St. Philomena’s (1965-68). He was appointed to serve as treasurer at Mount St. Alphonsus in Esopus from 1968 through 1969, before his assignment to Our Lady of Perpetual Help in Brooklyn. Having outlived most of the confreres with whom he worked in his early years, Father Crowe is best remembered now by people he met through his long ministry in Brooklyn. Sister Bernard Loreto, C.S.J., of Our Lady of Perpetual Help Convent in Brooklyn, recalls meeting him when she returned from her assignment in Puerto Rico in 1952. "He was such a good friend to my sister and brother-in-law," she said. "My sister had rheumatoid arthritis and he visited them a lot. Also, whenever I visited someone in a hospital, there he was. He was wonderful with the sick." 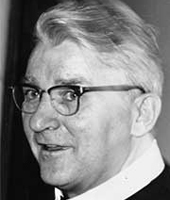 Father Francis Browne, one of his former rectors in Brooklyn, said, "He was a delight to live with, a very affirming confrere, especially for a young rector. He was extremely helpful and not afraid to roll up his sleeves and do any job. He did jobs nobody else wanted to do — like counting the money from the collections." Father Sylvester Feeley, who was with Father Crowe at Our Lady of Perpetual Help for 14 years, described his confrere as "a very educated person who lived a very interesting life." By the time Father Feeley got to know him, Father Crowe was supposedly "retired." "What I really admired about him was that for all the ceremonies and Masses we had, he was there, even when he had to use a cane." He also offered to fill in for confreres as the priest on duty for a given day, just in case there was a sick call or someone came asking for Confession. Since he kept in close touch with so many parishioners and former parishioners, he was often asked to celebrate family weddings or baptize the children or grandchildren. "He and I met quite a bit, usually for an afternoon coffee break," Father Feeley said. "He was a good companion in the house and very talented." Sister Madeline Therese, C.S.J., who served for many years as a teacher and then principal of Our Lady of Perpetual Help School, came to know Father Crowe in 1970. "He was in charge of C.C.D. and we worked well together," she said. "What was great about it was that he made sure the program had well-trained teachers. He sometimes seemed gruff on the outside, but those who worked with him knew he had a soft heart. He was very kind, loving and caring. He did a lot of things for people that others never knew." The school accountant was amazed that there were never any repair bills, Sister Madeline Therese said. That was because Father Crowe fixed anything that broke in the rectory, in the school, even in the homes of elderly parishioners. On his days off, he often invited Sister to go with him to visit friends who had moved farther out from the parish: "And he never went without his tool box!" She recalled one time when she was teaching in Bensonhurst and he came looking for her at the convent there. The Sisters told him she was finished with classes for the day and had gone to the beauty shop to get her hair cut. He tracked her down and announced to everyone in the shop that he was looking for his mother. "All the women were looking around to see who could be old enough to be this man’s mother," she said, laughing at the memory. Father Crowe never lost his love for visiting with people, even when advancing age brought him to St. John Neumann Residence. Father Michael Sergi, the rector there, said: "He was a kind and gentle man. When someone came to see him, he lit up! He could have been talking in the morning about feeling old and I’d come back from an errand later in the day to find a bunch of people had come to see him. He’d be there holding court for his guests." His youngest sister, Charlotte Fuhrman, said that "he used to walk the streets and he seemed to have a sense of when people needed him. He could fix anything — even broken hearts!" When their mother died in 1957, their father moved in with Charlotte and Ted Fuhrman and their six children; their home became Father Crowe’s home, too, whenever he had a chance to vacation in Erie. "He was very much a family man and he understood family problems," she said. He remained very close to his many nieces and nephews and their families and when he was dying, his sister and her children were there with him.